Three powerful days in Washington, D.C. taught Sinclair School of Nursing students the power of their voices as nurses. 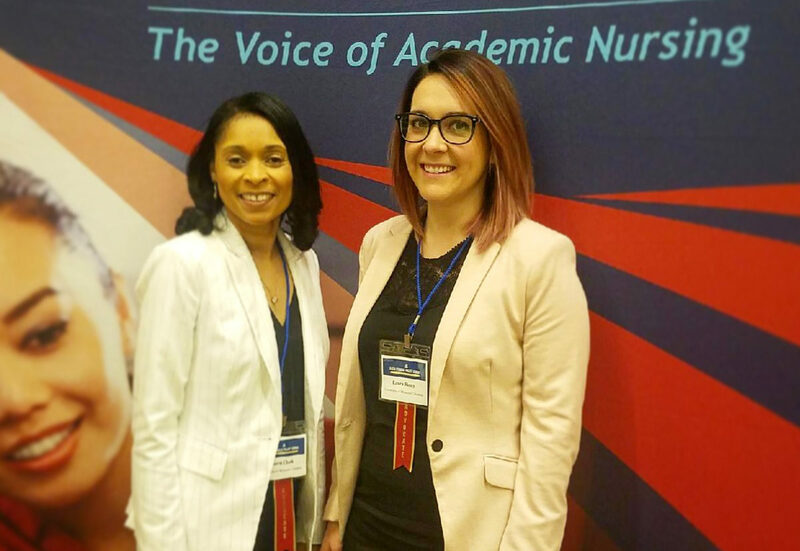 PhD students Laura Remy and Karen Clark joined hundreds of students from around the United States at the American Association of Colleges of Nursing (AACN) Student Policy Summit March 25 – March 28. Students learned about the ways nurses can impact policy formation and change and practiced building a distinct, scholarly message to give to legislators. Karen and Laura then delivered their messages, with four requests, to the staffs of Sens. Roy Blunt (R-Mo.) and Claire McCaskill (D-Mo.). Cosponsor the Title VIII Nursing Workforce Reauthorization Act, which ensures communities have access to timely care through a diverse nursing pipeline as well as the faculty to educate future generations of nurses. Support the repeal of the Dickey Amendment, which prevents the Centers for Disease Control and Prevention funding gun violence research. For Laura, the experience stoked her existing passion for policy. In fact, Laura plans to take action this election season by working with an elected official in her area. Though Karen did not have any previous experience in policy, she too learned the power of her voice. Karen is a Robert Wood Johnson Foundation Future of Nursing Scholar who is researching caregiver stress of grandparents raising their grandchildren. She anticipates graduating in 2019. Laura is a National Institute of Nursing Research (NINR) funded T32 Behavior Science Pre-Doctoral Fellow. She is researching the development of behavioral interventions to enhance the outcomes in vulnerable populations living with chronic health conditions, such as HIV, and anticipates completing her PhD in 2020.